Roma Deluxe Electric Tomato Strainer model 82-0202W makes your life relaxed by isolating fruits' skin and seeds from the juice and pulp quickly. Now you don't have to perform complex task of peeling or coring fresh fruits and vegetable- Roma Electric Tomato Strainer does this task effectively. It also features compact design that makes it portable. Roma Deluxe Electric Tomato Strainer facilitates no more peeling or coring fresh fruits and vegetable. It allows you make delicious tomato sauces, soups, jams, baby foods, juices and more enriched with nutritional content and freshness. It effectively and quickly isolates fruits' skin and seeds from the juice and pulp. Designed ergonomically, it can be easily cleaned up with a dishwasher safe plastic drain chute and hopper. 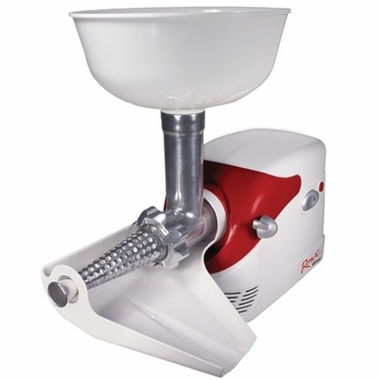 The Roma Deluxe Electric Tomato Strainer features 200 watt motor and large hopper, while the tamper safely pushes food into the strainer, and with forward and reverse operation it is bound to give you impressive peeling and coring operation. This is a fine piece of machinery. I made two bushels of sauce. It does exactly what is described, however I'm not to happy because I ran into some issues of juice coming from underneath the motor housing. Possible bad seal? I don't think this is suppost to do this is it? It would have been 5 stars but because of this issue to me it only gets 3.
great machine / product. Outstanding service with the corporation, great communication!